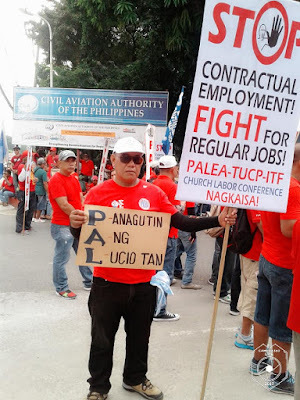 With Philippine Airlines (PAL) settling yesterday its arrears to the government amounting to some P6 billion, the the union Philippine Airlines Employees Association (PALEA) called on the national flag carrier to likewise pay its debt to its outsourced workers. PALEA is demanding that PAL implement the settlement agreement forged in 2013 to end the long-running dispute and reinstate some 600 outsourced workers. “We are confident that simlar to PLDT, PAL and PAL Express will also be found gulity of illegal labor-only contracting and thus be ordered to regularize its thousands of agency workers and reinstate the PALEA 600,” Rivera argued. Yesterday, various labor and church groups, including PALEA and PM, met at the Arzobispado de Manila in Intramuros to assess the ongoing campaign against contractualization and vowed to push the administration of President Duterte to make good on its promise to end endo. Manila Auxiliary Bishop Broderick Pabillo reiterated the support of the Catholic Church to the fight of workers for regular jobs, including the reinstatement of the PALEA 600.